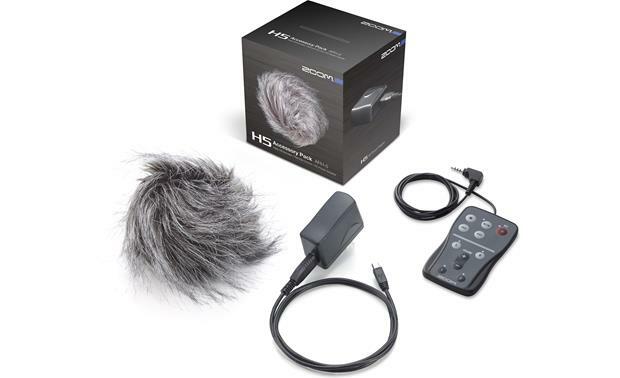 This accessory pack helps you get more from your Zoom H5 handheld digital recorder. It includes a pro-quality hairy windscreen to minimize low-frequency noise from wind during outdoor recording. There's a wired remote control to maintain control of the recorder's basic functions even when it's set up across the room. And the AC adapter is easy to plug in for power when your batteries run down. This really should come with the Zoom 5 recorder. Especially, the ac adaptor but since it doesn't most people will want this kit. Unless maybe they have stock in battery company. Hairy Windscreen: This "hairy" windscreen features long faux fur to diffuse the wind from the H-5 microphones, providing a professional level of wind noise suppression. It has a drawstring closure to secure the windscreen to the recorder. RCH-5 Remote Control: The 11-button RCH-5 wired remote control gives you the ability to select the inputs or playback tracks (L, R, 1, 2), and start and stop recording and playback functions from a distance. The remote features transport control buttons such as Record, Play/Pause, Stop, Skip Forward, and Skip Backward. It also has a two-button volume control. The attached cable and the supplied extension cable have 2.5mm sub-mini plugs. AC-17 AC Adapter: This adapter allows you to operate the H-5 on AC power. A USB cable is included for connecting the H-5 (Mini-B 2.0 USB) to the AC adapter (Type A USB). Searches related to the Zoom APH-5 Accessory pack for Zoom H5 handheld recorder.